Thank you for visiting. My Blog has moved to downtowntrader.com and is now a part of the Stocktwits Network. We have moved all of our content into the archives at the new site but I am leaving this site up due to the many sub pages still indexed by search engines. Thanks again for reading and I look forward to many more years of market commentary and trader education articles. While I am firmly in the camp that believes we have set a very important generational low, I have to say the market is starting to get ripe for a swift correction as it approaches some key resistance levels. Recently, I've noticed the level of bullishness on the stocktwits stream increasing and many sentiment indicators are revealing a similar pattern. While the current market still has some room to continue in the near term, some indexes are approaching a key resistance level after what has been a great rally. While some indexes like the Russel 2000 and Nasdaq 100 have already cleared similar resistance areas, the key index I am watching is the S&P 500. This is because most of the concerns during the recent bear market revolved around the financial stocks and thus it would take more confidence from investors to push this index back above key resistance levels. I recently mentioned this thought in one of my recent market review articles and I thought it would be a good time to post a long term chart to show what I'm looking at. 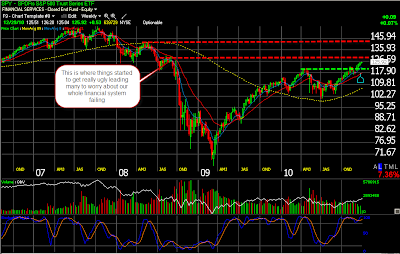 In looking at the chart below, I am using SPY as a proxy for the S&P500. 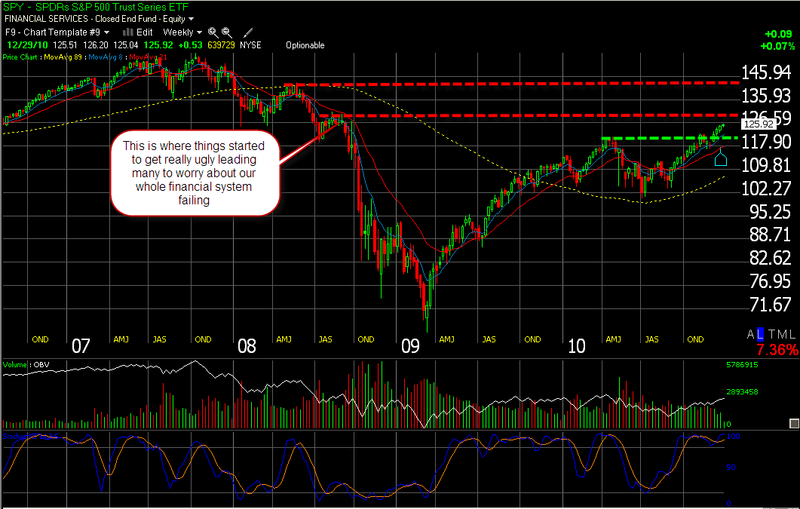 I highlighted a couple of important highs from 2008. The first level is near SPY $142 and is where some would argue the bear market began as the markets set a lower high after breaking down from their base. While this is certainly an important level, the next lower high set in August near $131 is also worth watching. This is when the bear decline really picked up steam and not coincidentally, when most retail investors started to panic. As humans, we have a tendency to not want to lose. As such, one common behavior in the markets is for a trader always look to get back to "Break Even" after a loss. This is one area where many traders would feel they are "back to even" and look to protect themselves. I've noticed that while many traders are becoming increasingly bullish, many still doubt the rally off the 2009 lows because it is largely manipulated and currency based. This is actually powerful fuel for further gains in the markets longer term, but shorter term there are some warning signs that we are close to another inflection point. Recently, many trash stocks have risen to being among the best performing and most active stocks. This is usually a warning sign that market participants are chasing rewards rather than acting prudently. Many market leaders are also slowing down and seeing some profit taking. There are many possible scenarios unfolding, and in my opinion the ideal action right now would be for the markets to trade sideways in a tight pattern building up fuel for a real breakout. However, this is not a likely scenario judging by the recent action and the fact that we still have some room to run in the near term. Some key indicators like the Mclellan and Worden's T2107 have room before becoming really overbought, so its possible that we squeeze higher before reversing. In either case, I am preparing for all sorts of scenarios, and the market continuing higher through these levels without a correction of some sort is the least likely. Traders should continue to respect the current rally as it has continued to frustrate shorts, but I for one have been protecting profits and keeping my trades very short recently. The markets have ripped higher the past two days and it has become increasingly more difficult to find stocks at decent buy points. Traders should always be leery of buying over extended stocks as an simple retracement could put them into a position of weakness. The last thing a trader wants is to buy a stock near a high, and then be forced to sell as the stock retraces in a normal manner. 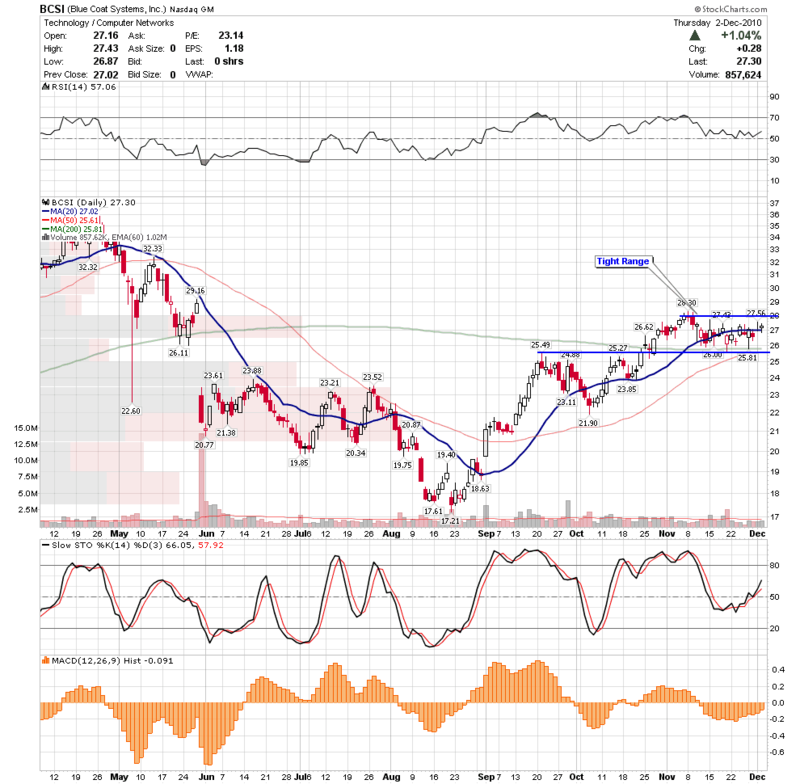 Usually, this is compounded by the stock turning right back higher. The following are stocks that are still near decent buy points and are on my watch list for the next few days. 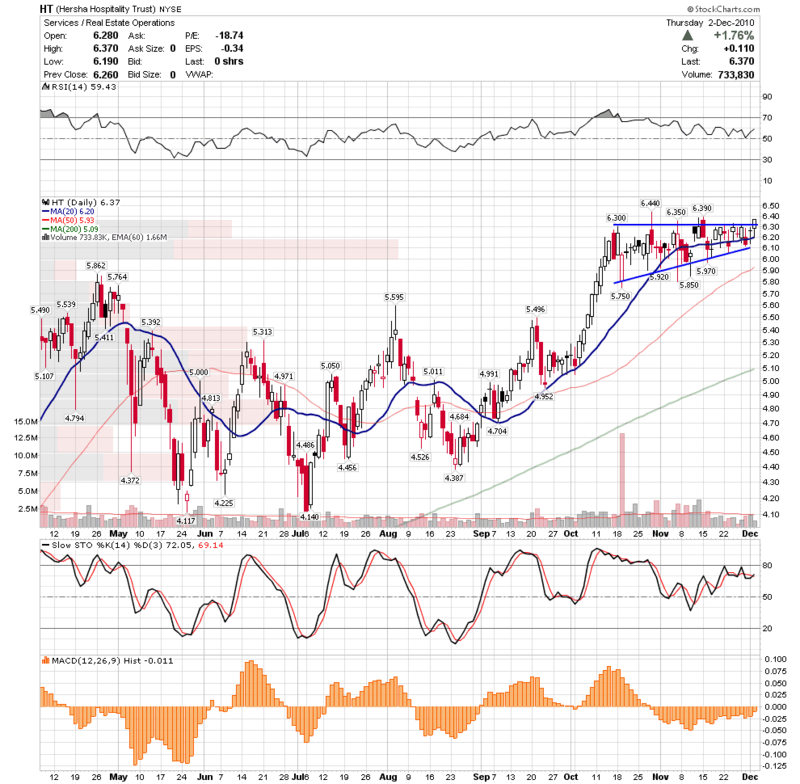 The Boston Beer Company, Inc. (Public, NYSE:SAM) is trading in a tight range after a sharp breakout. It is showing great strength by refusing to give up any of the recent move. 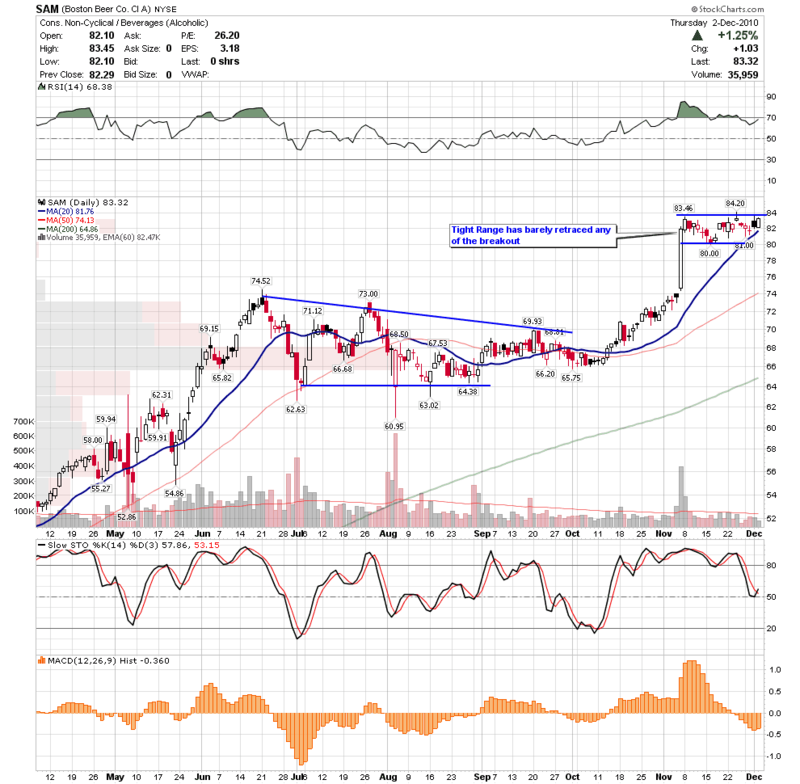 Blue Coat Systems, Inc. (Public, NASDAQ:BCSI) is still trying to recover from a correction that began in May, but has recently settled into a tight range above a possible bottoming base. BCSI has quietly begun to set higher highs and a move above this tight range could send it into a price void above. Notice the vast majority of trading volume has occurred under the current price. 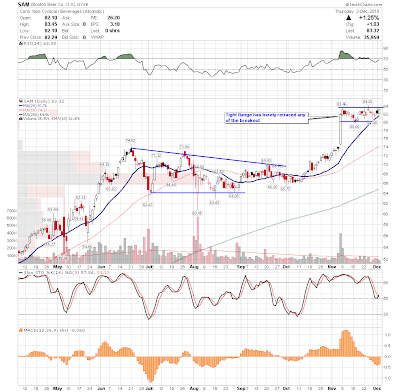 Hersha Hospitality Trust (Public, NYSE:HT) is a cheapie and relatively slow mover, but this pattern looks really good. HT cleared its base in October and has settled into a tight range above the base. 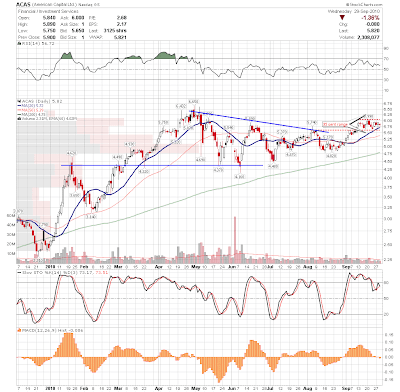 It looks like it is trying to breakout here and the whole REIT group may be ready to resume its run higher. The three charts above have one important commonality. They all feature a tight range above a support level. Trading a move above these ranges would be much safer then trying to jump on some of the stocks that have recently broken out like RiT Technologies Ltd. (Public, NASDAQ:RITT) or Finisar Corporation (Public, NASDAQ:FNSR). The Stocktwits team introduced the "Stocktwits 50" a few months ago which is a weekly list representing the stocks with the strongest fundamental and technical characteristics. While their methodology is proprietary, they focus on earnings growth, relative strength, and other technical ratings designed to filter the strongest stocks. Because the list is rebalanced weekly, they consistently have great trading ideas. Although I am primarily a technical trader, I've been a long time believer in following stocks with strong fundamentals and relative strength. Investors Business Daily has a similar list named the IBD 100 and I have diligently followed this list as well. The way I have used this list is by importing it into Telechart 2000 and then watching the stocks daily for technical setups. Below I will show how I import the Stocktwits 50 into Worden's Telechart 2000 in order to have them in a custom list that can be reviewed daily. 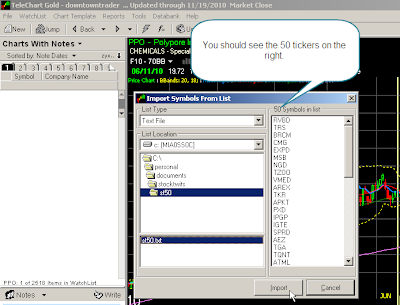 This tutorial will show you how to end up with a text file of the Stocktwits 50 that can be imported into Telechart. However, users of other charting programs could also likely import the text file into their package in a similar way. The first step is to browse to the Stocktwits 50 and copy the Stocks. 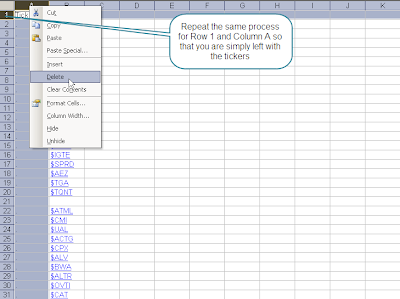 Because it is in a table, you will have to drag over the table and select all the data down through the end of the list. From there, right click and select copy. 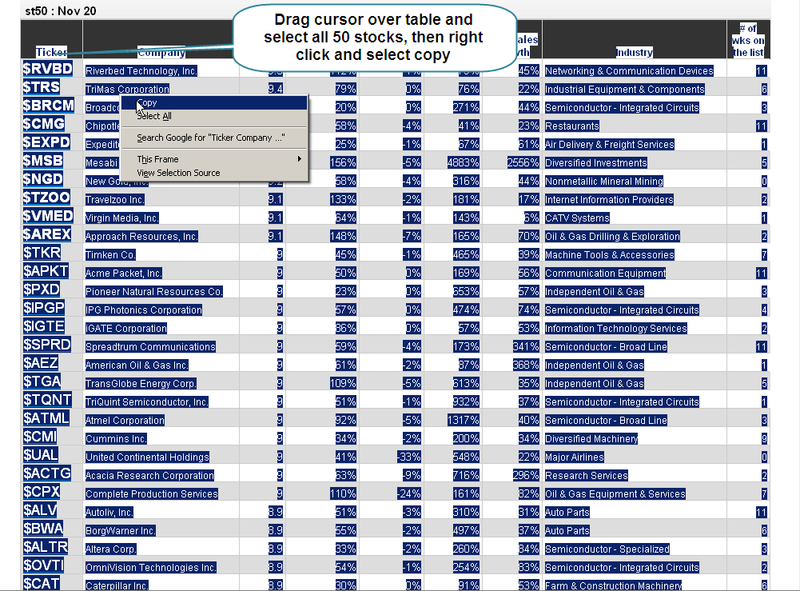 This will copy the table into your clipboard. 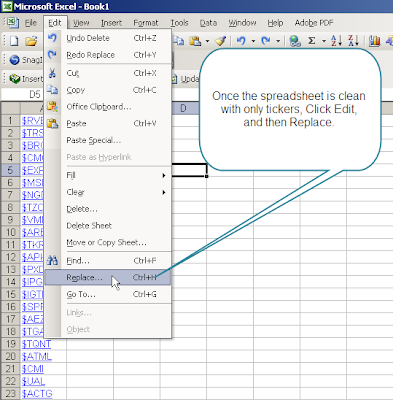 The next step is to open your spreadsheet software and then paste the information. 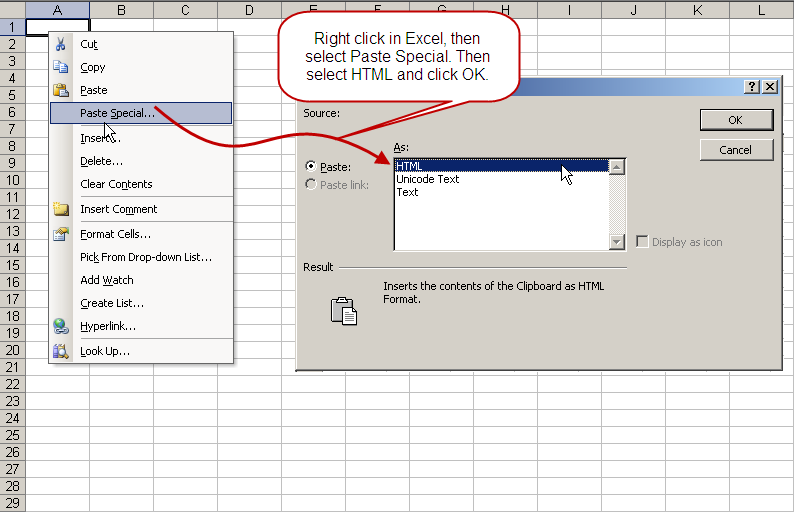 In Microsoft Excel, I right click in the first cell and select paste special. From there I select HTML and click OK. This should paste the table into your spreadsheet. Don't worry if its not formatted too pretty as the purpose of this exercise is to simply end up with a list of the stocks in a text file. 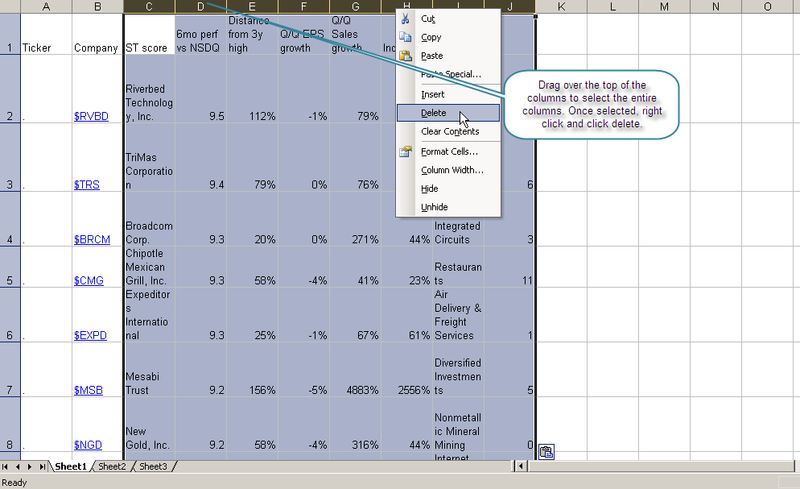 Highlight all the columns to the right of the tickers and then right click and select delete. 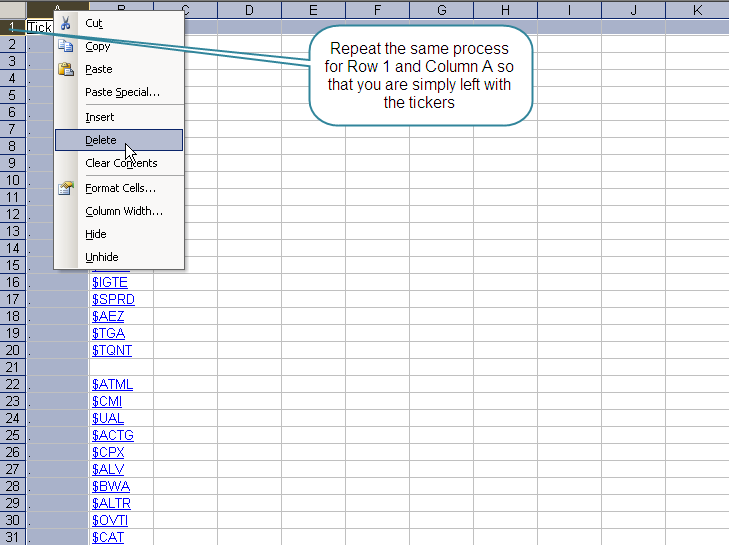 After this, repeat the process and remove the column to the left. I also ended up with a few blank rows, so I deleted those as well. The point is to end up with only the tickers and nothing else. 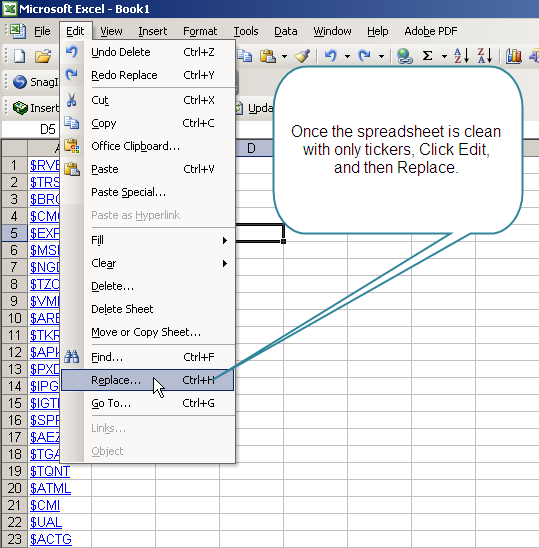 Now that the spreadsheet is clean, you should have a list of only the tickers. The next step is to remove the $, because your charting platform will not otherwise recognize the stocks. 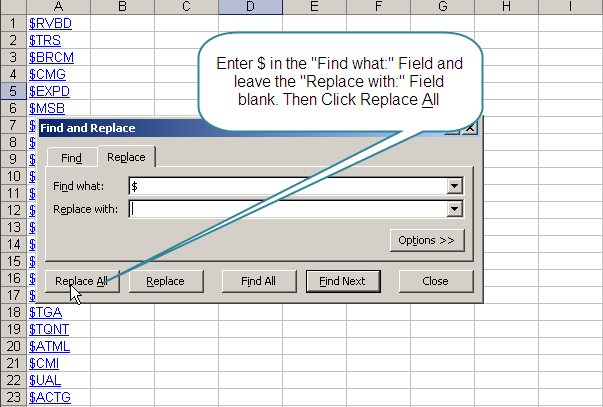 To do this, click Edit and then replace. 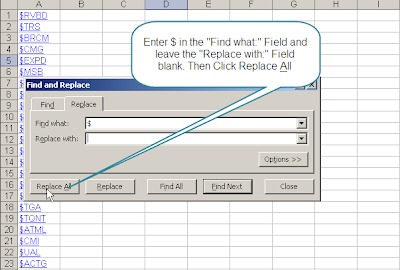 From there enter $ in the "Find What" field and leave the "Replace with" field blank. Then click Replace All. This will in effect remove the dollar signs. 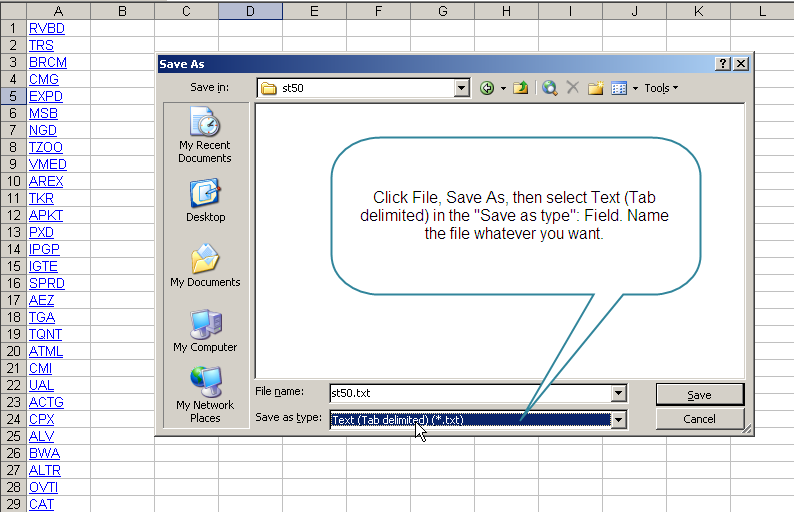 Once this step is done, simply click File, Save as, and select Text (Tab Delimited) in the Save as type field. 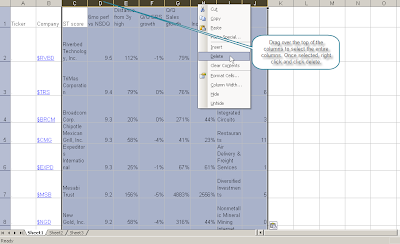 Now that you have a text file with the tickers, you can import it into Telechart. 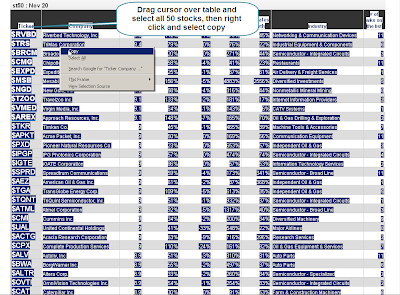 If you use a different charting package, check to see if you can import from a text file. In Worden, you would first create a New Watchlist. 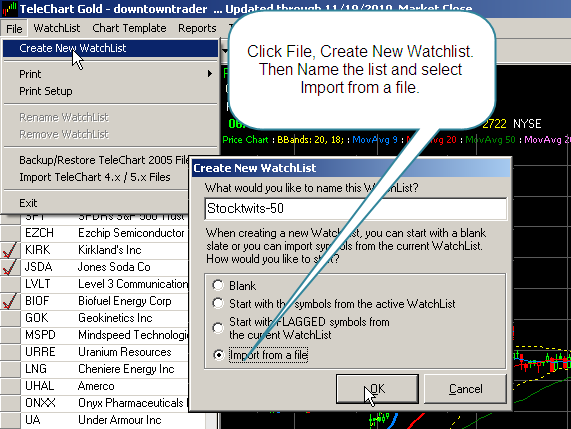 Click File, Create New Watchlist, and select Import from a file. 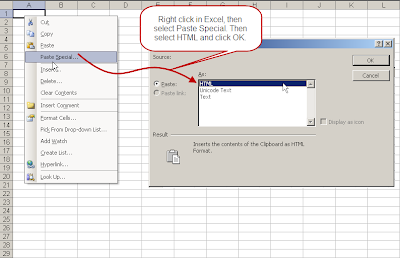 Then browse to your Text file and import it. Now you should have the 50 tickers on the right and can now start browsing the list with Telechart. 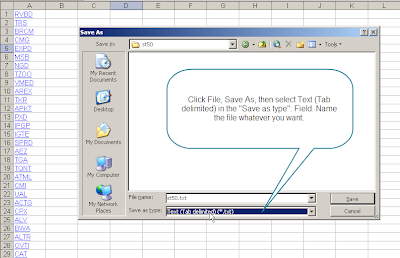 Everyweek, you can simply remove the tickers from the list and import an updated text file. Simply monitoring strong stocks can greatly improve the quality of your trade setups, and by monitoring the Stocktwits 50, traders have a free list of many of the strongest stocks in the market. This is simply one method of utilizing this group of stocks and traders should consider other ways to mine this data. I have been a big fan of SMB Capital and Mike Bellafiore for several years after watching them on Wall Street Warriors and then following their trading blog, twitter account, and ultimately their shows on Stocktwits TV. I have always admired how well they are run as a prop firm and the dedication they show towards enabling the success of their traders versus the approach of other firms who are more concerned with generating their cut of commissions and simply recruiting more bodies once their traders fail. They are consummate professionals and actually quite innovative in how they have introduced tools like film review and simulators into the prop trading world. Beyond the obvious success as a firm, they are also one of only a handful to provide outsiders a glimpse into the prop trading world which has remained foreign to the vast majority of retail traders. I had been eagerly awaiting Mike's book "One Good Trade: Inside the Highly Competitive World of Proprietary Trading" since he announced it, and finally had the pleasure of reading it recently. Mike starts by bringing us into his desk to meet some of his superstar traders. In profiling several individuals, he shows us the common traits they have and more importantly, how each trader became successful by adapting their trading to fit their personality. Later on, Mike reveals several traders who for some reason or another were unable to make it as traders. Most books only focus on traders who have made it, or the techniques the author believes will make a trader successful. However, this is the first book I remember that walks through real life examples of the traits that will inevitably lead to a trader's failure. Some people may be disappointed in what they would see as a lack of an "A to Z" trading system revealed in the book, but the most important factors for a traders success are clearly laid out in the book. While Mike discusses some of the techniques they use to trade, the clear message of the book is how important it is to work hard to develop specific trading skills which can later be used to help a trader adapt to any market. The idea of developing specific skills is an interesting concept, and one more commonly seen in the sports world. The title of the book is One Good Trade, and you get to one good trade by developing specific, repeatable trading skills. It also wouldn't be practical to attempt to cover all the material it takes months to cover in a class, and then years to refine, into a book. However, this isn't to say that nothing is revealed. The book does reveal many of the specific setups SMB uses on a daily basis to make money in the market, and highlights how important it is to trade "stocks in play" and rely on tape reading skills. In fact, if you combine everything in the book, along with the several blogs and video shows, a trader would have a very good idea of how SMB trades on a daily basis. The idea of sitting on a desk with so many other traders who are just as committed to the markets as you are is incredibly enticing, and this book provides much insight into this environment. While Prop trading is definitely not for everyone, the approach laid out in this book is the basic groundwork for any successful trading methodology. Beyond this, there is much to glean from a trader who has adapted to several markets over the years and not only survived, but improved along the way. I highly recommend this book as an addition to any traders Library. Get ready for the Second Annual Stocktwits Community Members Charity Poker Tournament benefiting the Tuberous Sclerosis Alliance. The Tuberous Sclerosis Alliance is an organization dedicated to finding a cure for tuberous sclerosis while improving the lives of those affected. Tuberous sclerosis complex (TSC) is a genetic disorder that causes tumors to form in many different organs, primarily in the brain, eyes, heart, kidneys, liver, skin and lungs. This charity hits home for me, as I have a friend who has a child with this disease and the child has already had several surgeries despite being a toddler. As a fellow parent, I could never in my wildest dreams imagine having to struggle with watching my children suffer through a disease like this. One problem with this disease is that it is relatively unknown, so hopefully we can also raise awareness while also raising funds. Last year, as a community we raised over $3,000 and hopefully this year we can top that number. This years tournament will be held on November 7th at 6:30pm EST on FullTiltPoker.com. Last years tournament was a blast and this year should have even more of your favorite Stocktwits community members participating. This will be a great chance to compete directly with Howard Lindzon, Phil Pearlman, Brian Shannon (@alphatrends), John Lee (weeklyTA), Jim Gobetz (aiki14), Mike Bellafiore (@smbcapital), @stockguy22, and others. In addition to the cash prize pool, there will also be Stocktwits prizes awarded for knocking out certain players, as well as being able to talk some smack on the stream throughout the evening. If you are interested and want to learn more, please visit our site dedicated to the tournament. As many of you who read my posts regularly know, I love trading narrow range setups. The primary reason for this is that I can greatly reduce my risk by stopping out as close to my entry as possible. This allows me to increase my risk versus reward as a multiple. In other words, if you are trying to limit yourself to trading opportunities with a minimum of 3:1 risk versus reward, it is much easier to shoot for a $1.50 gain while only risking $.50, than it is to shoot for a $15 gain while risking $5. While keeping your risk tight may expose you to more whipsaws, by waiting patiently for these narrow range setups to develop and then pouncing as the range is cleared, a trader can keep their win rate at acceptable levels. Another important note is that a narrow range setup is not a trading system. It is a trading technique that can be applied to any setup or system. Traders can adjust this technique to their system by applying it to intraday time frames, or by using it as an entry technique for their own trading methodology. Not all stocks will provide a perfect entry with minimal risk, but traders should always be looking to be as efficient as possible in setting their risk. The following setup is one example of how I trade using a narrow range to base my trading decision from. American Capital Ltd.(Public, NASDAQ:ACAS) had more than doubled in price between January, 2010 through May, 2010 before settling into a consolidation. This type of rally typically needs some time to absorb profit taking, and ACAS has been building a base since its May peak. Notice how the trading range was wide and volatile in the beginning of the base and has slowly narrowed in range as buyers and sellers reach an equilibrium. This is healthy behavior as shares exchange hands among market participants. The first positive step in this pattern is when ACAS cleared a descending trendline in September while also setting its first higher pivot high in months. It had also started to set progressively higher lows since June showing that buyers were slowly increasing their bids. While the breakout from the triangle it had formed was a possible trading signal, the risk versus reward was not that attractive after a 3 or 4 day rise. However, ACAS has since settled into a very tight range while maintaining above its August high. The current trading range is only about 35 cents wide, which would leave a trader with a very small risk on a break above this range, assuming a stop out on a move back below the range. A trader could possibly tighten the stop even more, using the bottom of the candle used for the trades entry. So assuming an entry near $6.00, the most conservative target would be taking profits near the prior high near $6.65. While this works out to roughly 2:1, this setup actually has the potential for a much bigger gain. 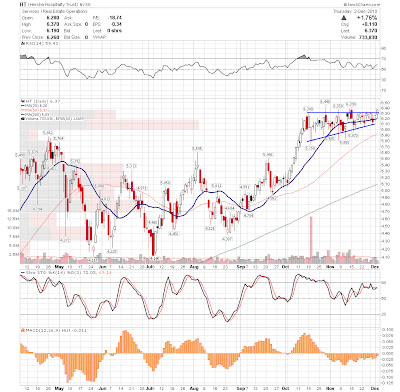 The measured target for the triangle breakout is closer to around $8.00. While I would likely be more conservative an eye the January 2009 peak just above $7, the potential for a surge does exist. 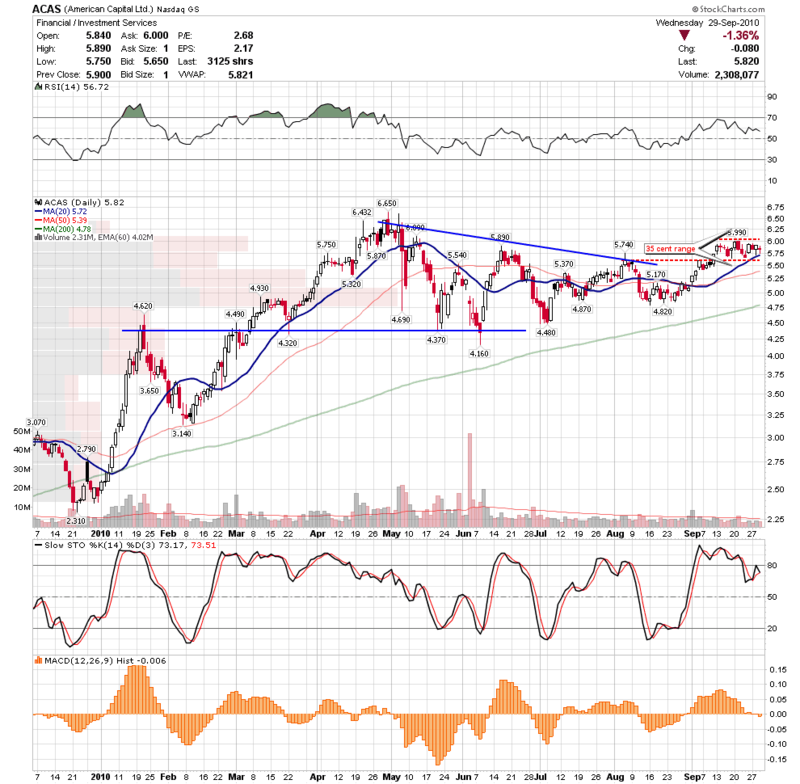 So this setup is attractive to me based on the fact that ACAS is starting to emerge from a base and has exhibited signs of accumulation. The narrow range that has formed as it consolidates is simply offering me a possible low risk entry for the thesis that ACAS will breakout from the overall pattern. While it would be tempting to cheat and buy before ACAS picks a direction, it is usually a better idea to wait for it to move out of the range. While sometimes you won't get stopped out, these stocks will often remain in a tight range much longer than you wish to wait. While this trade is not fool proof, it is a trade I would take based on the small amount of risk involved. Traders should always keep an eye on how much they are risking first, and then the possible reward. If the setup fails, it's fine because the risk was limited and will be made up by the gains on the successful trades. 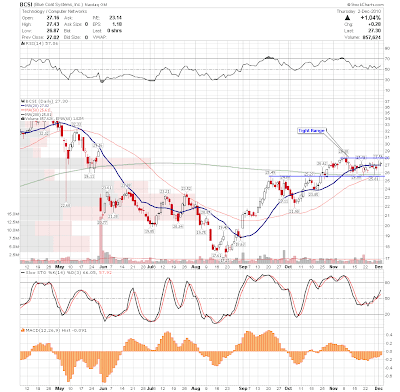 If the markets cooperate, then ACAS may soon emerge from this tight range and possibly offer a trading opportunity.